After just getting home from San Diego the day before yesterday, I wasn’t too excited to get back on a plane again. Once I got here and visiting with friends, I’m getting my energy back! 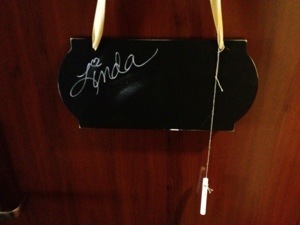 This cute little chalkboard plaque was hanging on our hotel room doors with our names. 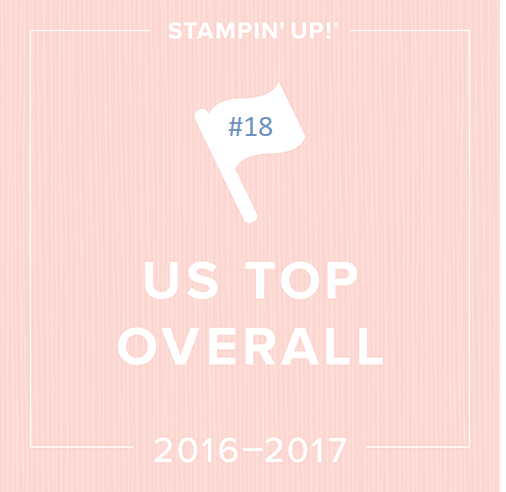 Stampin’ Up always decorates the doors in some way and now we can leave each other notes! 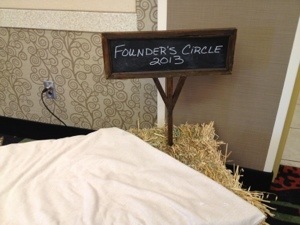 There seems to be a burlap-country kind of theme this year. Usually they reveal more as the event goes on. They had a little horseshoe pit in the hospitality room and surprisingly I got a ringer and won all three prizes! Let’s see if I can do that again tomorrow. The three prizes I won included the season of style journaling tags, Which I was wanting to get and play with anyway so I will have fun using those. 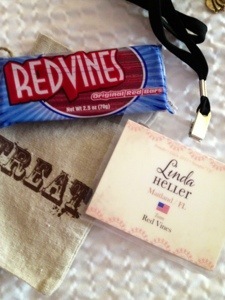 The red vines candy is my team name and I had to find my other teammates so we could get a prize. We also sat together at dinner and enjoyed getting to know each other better. 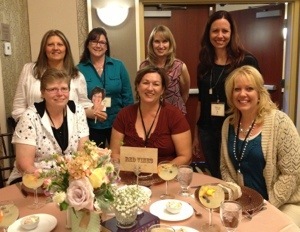 Angie Juda, me, Karina, Catherine Pooler, Mary Polcin, Natalie Travis and Tina Weller. 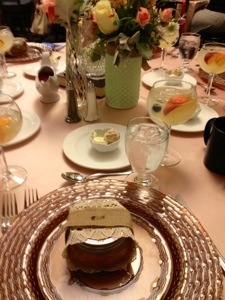 We had a nice dinner and the tables were beautiful. 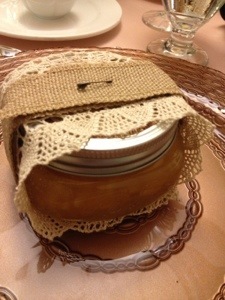 If you were wondering what was on the charger plate wrapped up in the burlap ribbon, it’s a jar of homemade peach jam. 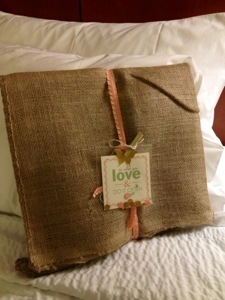 After a wonderful dinner like that I wasn’t expecting to find a pillow gift when I got back to the room! Because this gift is all new product that’s not available till the next seasonal catalog, I am not supposed to post what was inside but I can tell you that I squealed with delight and truly love love love it all! 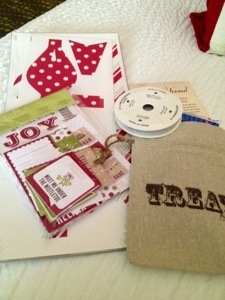 I’m hoping we will use the stamp set for our make and take projects so I can show you a few of those. 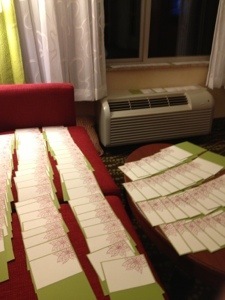 Many demonstrators were working on their swaps today for our big 120 card swap tomorrow night. I still need to assemble mine but added some silver glitter glue to the insides before dinner so they could all dry! Even the window ledges are full of cards! Tomorrow will be a lazy day of assembling swaps, chatting with friends and relaxing a bit before our pajama party tomorrow night! Thanks for the share. Hi to Brenda Keenan from san Jose who is there too. Thanks for sharing! It’s always fun to hear what you do and see what you get. You are quite the “JET SETTER! !” Have a great time!! Can’t wait to see the ideas you come back home with. Safe travels!! Looks like a lot of fun. 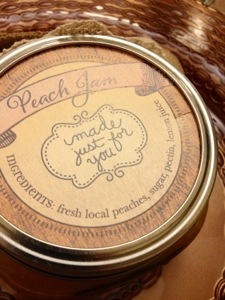 Looking forward to seeing all your new goodies. Love hearing about all of your adventures in the stamping world. Have a wonderful time!